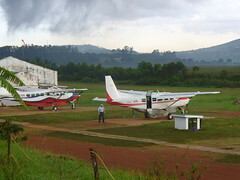 We left Kampala on the 7.30 am MAF flight to Karamoja.Flying from Kampala in the South to Karamoja in the North-East was uneventful, but mind-blowing. 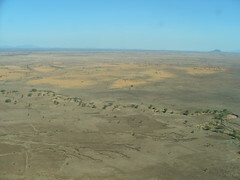 As we crossed the Nile, and got closer and closer to Karmoja, the land went from being lush and green to dry and brown. 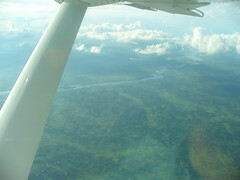 River beds were very visible, with not water to be seen. I asked Laurie, the pilot, how long they stayed wet for. His reply was just one day. This is a region that only gets 5 cm of rain a year, and yet people have lived here for thousands of years. 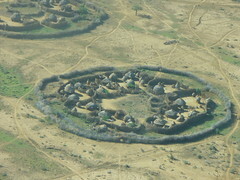 Arriving in Kotido was very exciting. To finally be here after seven months of planning was a great feeling. It was mid-thirties, so we found the nearest bit of share to wait for our pickup. After a fantastic welcome ("you are most welcome" was a phrase we would hear a lot from then on), we got to work. More on that next post. 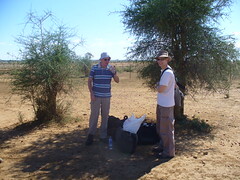 Our accomodation was basic, but suficient. 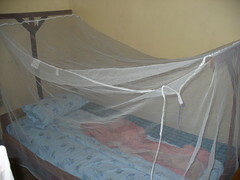 We were just very glad for the mosquito nets! Great to be able to read your blog and see the photos on Flickr. Praying for you all and hope it's going well. Give our love to all the team. Great to read the updates, and to see the photos. As with Sarah and David, we are praying. 2. Nothing is impossible for God.